Another in a series of stories profiling Penn Manor alumni who are doing interesting things with their lives after graduation. Man or machine? Either way this guy is alumni. 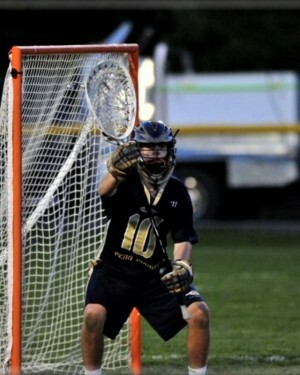 Peter “Petey” Deluca is a Penn Manor High School grad from Conestoga, Pa., with a natural ability to stand between the pipes playing goalie in lacrosse like a brick wall. Deluca’s legendary career is entering its prime as he decided to continue his athletic success from Penn Manor at Jacksonville University – 80 degrees and sunny has its obvious advantages. According to Deluca, his college team is dedicated. “Everyone works hard and looks forward to practice,” he reported. 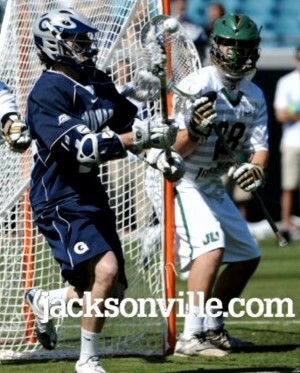 However, Deluca’s high school career needs more explanation as he was one of the top goalie prospects in the nation. He earned all-American status as a junior along with first team all-district and two all-league honors. He finished his senior season with 241 saves and a 70.2 percent save rate. The three-year captain demonstrated more than just lax skill in high school as he was a captain, member of the National Honor Society, Gold Honor Roll student and an AP Scholar. Deluca played with Blue Mountain, a stellar summer lax club since ninth grade and played for Adidas Central Pennsylvania’s team as a rising senior. Deluca’s skill never kept shy in high school as he constantly proved to be the best athlete on the field contest to contest. The best athlete on the field in high school proves a lot to the high school world, but what about the best athlete on the division-one playing surface? The dedicated player has taken his abilities to the next level as expected for the JU Dolphins where he has jumped in with the elite division-one bunch as a starter. Many freshmen don’t receive any playing time and often redshirt because of their less than hopeful chance of playing time. Deluca has proved otherwise as he’s been receiving tons of recognition for his star-like play. Deluca couldn’t say enough about the difference in play between high school and college. “Well it’s a different game. Pretty much everything changed, the athleticism was obviously the biggest difference,” he said. Deluca’s first game was a duel that will help his career, he recalled. 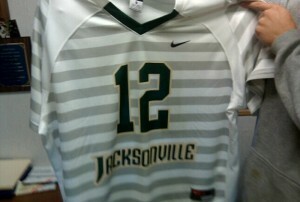 Staying in Jacksonville would satisfy nearly all teen athletes. However Deluca’s career has never settled for the easy road. The Lancaster county native has been flying all over the country to reach games. This first college appearance was an exciting match-up even if the final result was a loss. Deluca’s continued college play has just improved to 2-2 after a huge win against Air Force to put the Dolphins back on track. The freshman had a personal NCAA career-high 15 saves. The talented freshmen has a lot more fame to come as his success continues to rise. Deluca has been featured on lax.com and in a Paul Rabil, the Michael Jordan of lacrosse, video. Deluca is excited to continue the college season and hopes to make the NCAA tournament.